Presented as part of the Virgin Australia Melbourne Fashion Festival’s Arts Program, LCI Melbourne’s acclaimed warehouse campus will be transformed into a multi-level and multisensory fashion event. Work by young emerging designers will be featured alongside iconic designs from Romance was Born, Kit X, We are Kindred, Brothers Earth, Roopa and Cassandra Harper. 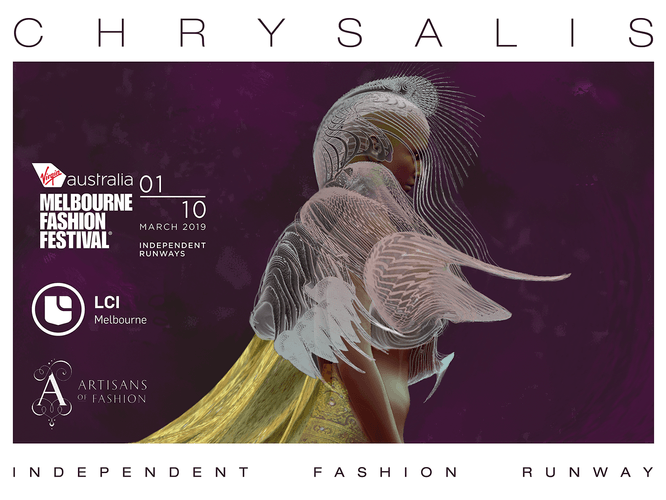 Stemming from a 6 month collaboration between LCI Melbourne and social enterprise Artisans Of Fashion, this runway will showcase designs that embrace ideas about metamorphosis and transformation with a key focus on sustainable design. Fabrics have been ethically sourced from hand loom weavers in India including the forest silk weavers in Assam, Ikat cotton weavers from Telangana and silk brocades from Varanasi. The resulting outfits provide an inspired interpretation of the ‘Chrysalis’ theme and display critical approaches to design, construction and ethical consideration.